I am quite new with ATMEL STUDIO. After checking some example codes from DEV Tools XPRO boards I have made my own PCB, including a SAMD21 MCU. Attached picture. My first intentention is switching on a led. The initial code obtained from ATMEL START is loaded to the ucontroller. Debugging, I concentrate in the file "startup_samd21.c". Well most of the times I can't see the Yellow right arrow indicating the code execution. I have the feeling that the main call (where ports are initialized in another function) is not executed. And I find the yellow right arrow stuck in the while on the Dummy_Handler() function. 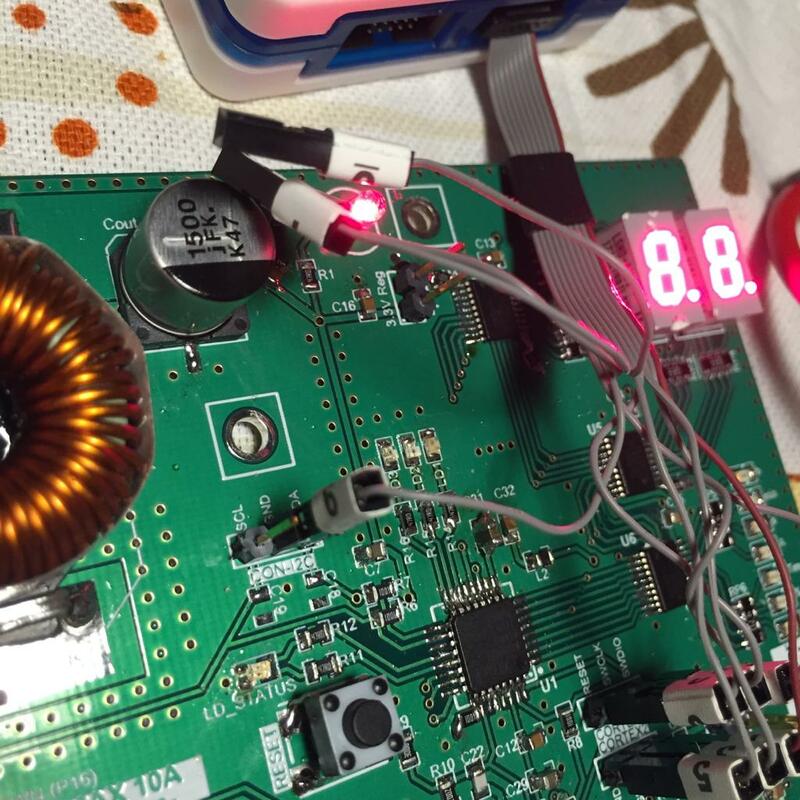 Phisically I expect to measure some voltage after the main, that does not happen. I am suspecting that the main function is not called. Can you please give some idea? It branches to the Dummy_Handler() function from several points of the code. Sometimes makes the for @Line229 and even some time has passed through the main but does not reach the code I could see something. and I am quite desperated, even after ugrading to 7.0.1931. I am not so skilled. While debugging open the I/O window and look at the NVIC registers. The ISPR is the Interrupt Set Pending Register. A bit in this register is set when a peripheral generates an interrupt, and the program jumps to the corresponding address in the interrupt vector, which you can see in the source file Device_Startup/startup_samd21.h. The bit numbers for each peripheral are in section 11.2.2 Interrupt Line Mapping of the datasheet. The flag in the ISPR is cleared when you clear the bit in the peripheral INTFLAG at the end of the interrupt handler. I have watched several times the debugging while checking the ISPR registers. These, all the time keep at 0. But I find some strange behaviour because sometimes I reach at Dummy Handler from line 223, others from line 243 or 245. The debugging flow is not always the same. I think it is not possible to enter into ___libc_initarray(). I mean "step into". I will try to check if the clocks are well set. This code comes from ATMEL Start and I have soldered a second PCB without any pheripheral. Just the microcontroller. I have created a handler for a HardFault. It is entering. Now, need to know what causes. Keep investigating. Thnaks.